Fireplace construction can be done with terra cotta, aluminum or cast iron in addition to brick. There are even veneer stone and brick materials that are fairly easy to apply that can give your fireplace a very traditional look. 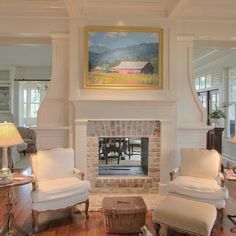 I just love the tile that she chose for this fireplace and how it plays so well with the oak mantel.